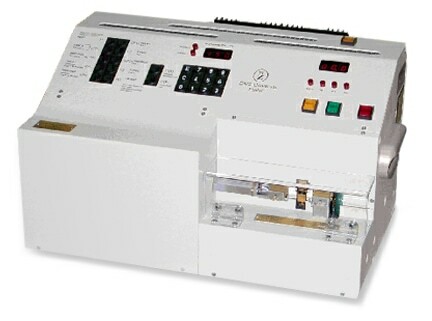 Electrode-Puller for fabrication of intracellular Glass- Microelectrodes, Injection-Microelectrodes and Patch electrodes. Pulling low resistance electrodes from thick-walled and thin-walled borosilicate glass up to 2 mm o.d. The electrodes are sturdy, reliable, and the instrument fabricates pipettes with high reproducibility. Pulling high-resistance electrodes up to 100 Mohms. Glass tubes are clamped automatically. Fully automatic polishing of the two tips. 80 programs can be stored permanently, all variables can be set independently. One- or two-stage pulling programs, in which all variables can be set independently for each stage, with the option of repeating the first stage. The puller is fully automatic. There is no risk of breaking thin-walled glass capillaries during fixation because two micromotors fix the ends of the glass tube by clamping them with precisely defined force. Even with three-stage-pulling, the two tips are symmetrical because the position of the glass tube relative to the heat filament is readjusted after each stage of pulling. There is no need for air-jet cooling because the duration of heat application is controlled by programmable approach and withdrawal of the (U-shaped) heating filament. The program can include sensing of stiffness of the tubing during heating which compensates for variations in the wall of the tubing. Free choice and absolute reproducibility of tip size (down to 0.1 micrometer), taper and electrode resistance (up to 100MOhms). Especially suitable for pulling patch electrodes of precisely defined tip diameter (usually 1-30 micrometer). Such electrodes can also be polished by the puller. The heating filament is made of KANTHAL©, a special high-temperature alloy. Although KANTHAL© is extremely robust and durable, the extremely precise control of filament heat, a prerequisite for the puller’s exceptional pipette reproducibility, requires that the filament heating time constant be as low as possible, Since this limits the lifetime of the filament, it is important that the filament be replaced in good time so as to maintain the pipette reproducibility. Compared to other pullers, the range of electrode tip sizes and shapes is relatively independent of the precise shape and position of the heating filament. Therefore repeated readjustment of the heating filament is not necessary. Because of the excellent reproducibility of the electrodes (even over months) the DMZ Universal puller is suitable for pulling electrodes immediately before use. Prefabrication of electrodes before the experiment is no longer required.